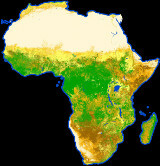 This global land-cover map was created using data from the Envisat mission for the 2010 epoch (2008 - 2012). This is the most recent data product from the Climate Change Initiative (CCI) Land Cover team led by the Université catholique de Louvain, showing 22 different types of global land cover classes, plus 14 regional land cover classes. 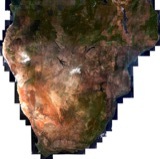 Following the GCOS Implementation Plan, the purpose of the CCI Land Cover project is to make the best use of available satellite sensor data to provide an accurate land-cover classification that can serve the climate modelling community. The maps propose a legend based on the FAO/UNEP Land Cover Classification System, in order to be compatible with previous products. The land-cover maps are currently under validation by regional experts, coordinated by the European Commission’s Joint Research Centre. Access the latest ESA CCI Land Cover products here.